There is nothing better than growing your own fruits and vegetables -- especially superfoods that can stretch your wallet at the grocery store. Many superfoods can be grown right in your backyard, and the benefits go further than saving cash -- they're packed with nutrients, and you have peace of mind that your produce has been grown organically. 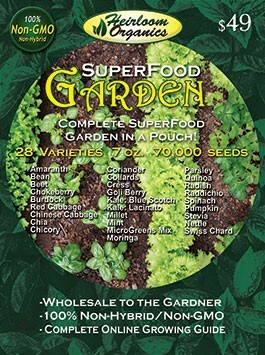 Heirloom organics makes superfood gardening easy for you with the complete SuperFood Garden in a pouch. Featuring 28 varieties, over 70,000 seeds (over 7 oz. ), this complete garden kit provides you with wholesale quantities of seed in a very inexpensive complete garden pouch. These nutrient powerhouses pack large doses of antioxidants, polyphenols, vitamins and minerals. Eating them may reduce the risk of chronic disease, prolong life, make you look younger and definitely make you healthier than those who don’t eat superfoods. Experience success with your superfood vegetable garden with the Heirloom Organics complete SuperFood Garden in a pouch!